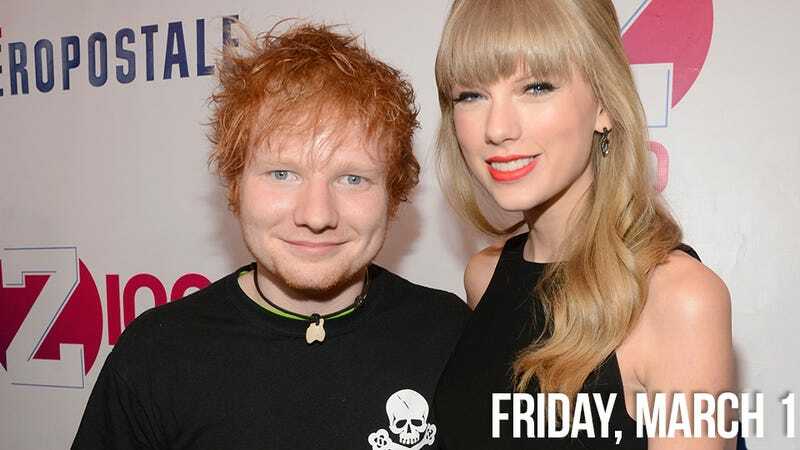 It's possible that your fevered collective fan dreams have come true—Taylor Swift and Ed Sheeran might be tenderly and respectfully fornicating. Apparently Sheeran was in T-Swizzle's hotel room before the Brit Awards until 4 AM, when Sheeran finally left looking "very pleased with himself" (according to some creep hanging outside in a tree like a bat who watched him leave her room, I guess). Rumor has it that the two, self-professed good friends, dated back in in March but broke up to focus on their careers, but now she's giving it another shot. Liam Gallagher, Oasis frontman and noted dickhead, negged The Wire star Idris Elba about his hat for no reason. "Liam was in full rock'n'roll swagger mode. He bowled up to the party after midnight and made his presence felt pretty quickly. Then he had a few words with Idris, poking fun at his bobble hat among other things. Idris looked like he was going to flatten him - they were on completely different wavelengths. "They were toe-to-toe at one point. Neither of them backed down. Idris was in a good mood, so left it, which was probably for the best. Liam left soon after."